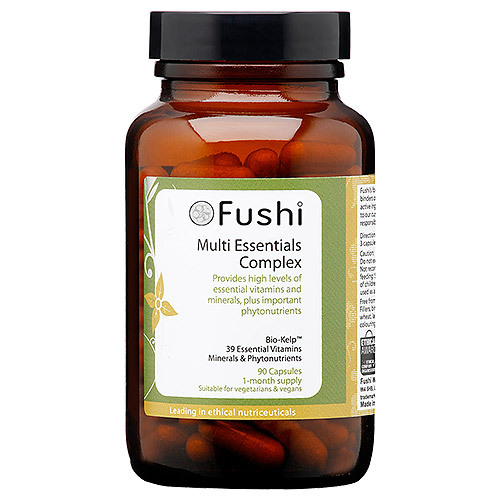 The Multi Essentials Complex contains all the essential micronutrients needed for optimum health, plus other compounds known to enhance health and improve digestion and absorption of nutrients. Formulated with BioKelp - a unique component to boost energy, diminish fatigue and promote vitality and wellbeing. It also includes kelp for its rich source of iron and alfalfa known for its benefits for cholesterol and its rich natural source of vitamin A, B, E, D and K. All nutrients in this complete multivitamin formula are in the most bioavailable (easily absorbed and utilised) forms possible to ensure maximum effects. Bio-KelpTM (Blend of Kelp (dried and powdered), Citrus Bioflavonoids, Hesperidin, Alfalfa), Calcium (Citrate.3H20), Magnesium (Citrate.H20), Choline Bitartrate, Vitamin C (Ascorbic Acid Powder), Kelp (dried and powdered), Potassium (Chloride), Zinc (Citrate.3.H20), Iron (Ferrous Fumarate), Inositol, Citrus Bioflavonoids 35%, L-Glutamine, Vitamin B6 (Pyridoxine Hydrochloride), Vitamin B5 (Calcium Pantothenate), Vitamin B2 (Riboflavin), Vitamin B3 (Nicotinamide), Vitamin E (D-Alpha Tocopheryl Succinate), Hesperidin, Rutin, Vitamin B1 (Thiamine Hydrochloride), Para amino benzoic acid (PABA), Alfalfa (dried and powdered), Apple Pectin, Bromelain 1,200 GDU/gm, Lecithin, Glucomannan, Papain, Selenium (Methionine 0.5%), Vitamin D2 (Ergocalciferol), Vitamin A (Acetate Type 325), Copper (Gluconate), Manganese (Sulphate.H20), Boron (Sodium Borate), Folic Acid (Folacin), Vitamin K, Chromium (Picolinate), Iodine (Potassium Iodide), Vitamin B12 (Cyanocobalamin), Molybdenum (Sodium Molybdate), Biotin (D-Biotin). If pregnant or breastfeeding consult your healthcare practitioner first. Below are reviews of Fushi Multi Essentials Complex - 90 Capsules by bodykind customers. If you have tried this product we'd love to hear what you think so please leave a review.